Back in June, we jetted off to Europe for a quick vacation. As we sat at the airport in Brussels, Belgium, with standby tickets set up to go to Lisbon, Portugal, we looked at the dreary weather that was blanketing much of that country and with a swift decision, we changed our plans to a destination offering significantly more sun; Tel Aviv, Israel. Upon arrival in Tel Aviv, armed only with a Lonely Planet guide-book purchased the day before, we made a decision to rent a car. We embarked on an improvised ten-day, self-drive tour around much of the country to explore the fantastic sites in Jerusalem, Palestinian Territories, Galilee, Dead Sea and Golan Heights. Now, the very mention of “diving in Israel” conjures up thoughts of the Red Sea with a palate of colors decorating the coral reefs and fish teeming about. However, what if we said we chose to explore the Mediterranean dive sites? 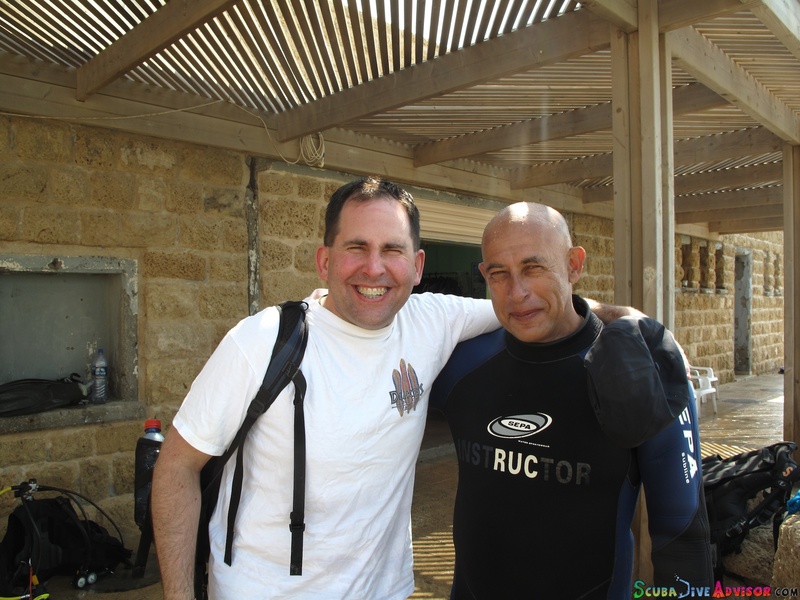 While lesser known, these dive sites are peppered with archeological possibilities and excite the diver’s imagination and Shira highly recommended them to dive at Caesarea. 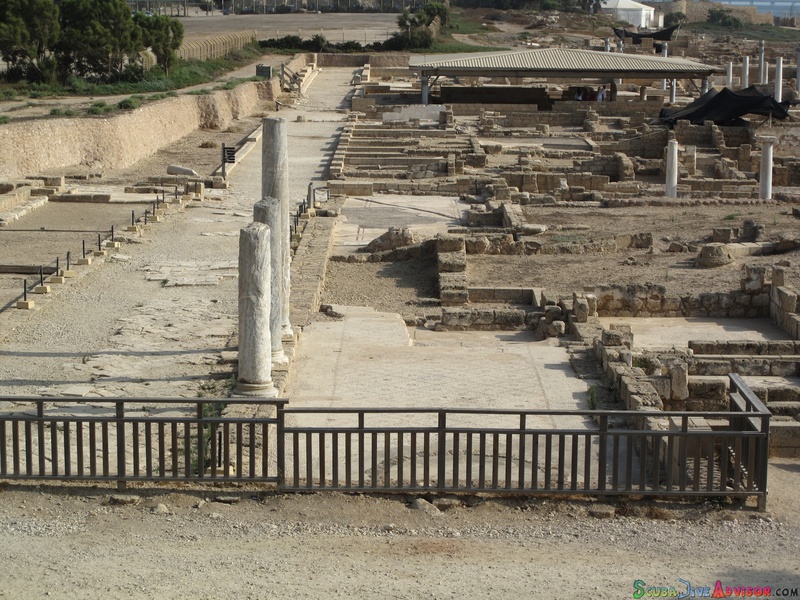 A little history… The historic port city of Caesarea in Israel was established by Herod the Great between 22 – 10 BC and named after its benefactor, Augustus Caesar, who bequeathed this region to Herod following the victory at the Battle of Actium in 31 BC. Herod’s determination to make this city great, resulted not only in the creation of a great Roman city with coliseums, baths, theaters & temples but also the construction of the largest artificial harbor in the open sea. Built to Vitruvius’ specifications, the structure of the two moles (breakwalls) was a stunning achievement in using ingenious Roman methods of poured concrete; a method that would be lost for centuries. A tsunami between the 1st and 2nd century would become a factor in the eventual destruction of the harbor which was eventually unusable by the 6th century. 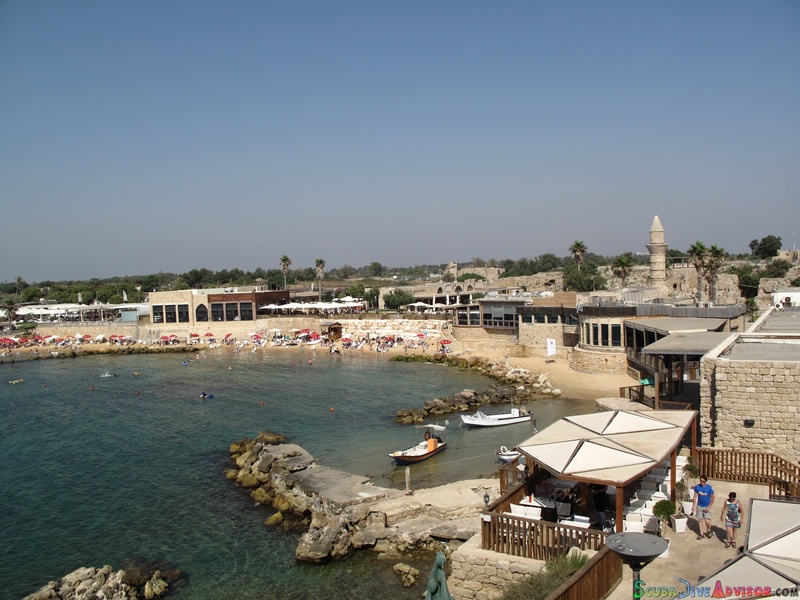 To gain a comprehensive understanding of Caesarea, read more on this interesting history on the dive center’s website about the design of Caesarea Maritima. Caesarea is now a National Park and it must be noted that there is a nominal park entrance fee. The site is simply gorgeous with numerous archeological sites above land as you make your way to the modern coastal esplanade. West facing, the design of the park is impeccable! A great deal of attention has been paid to tastefully blending the design of modern restaurants, cafes, shops and museums with the surrounding archeological beauty. And the beaches? Spectacular and only made better without a cloud in the sky! Wow. We haven’t entered the water yet and this place is already incredible. 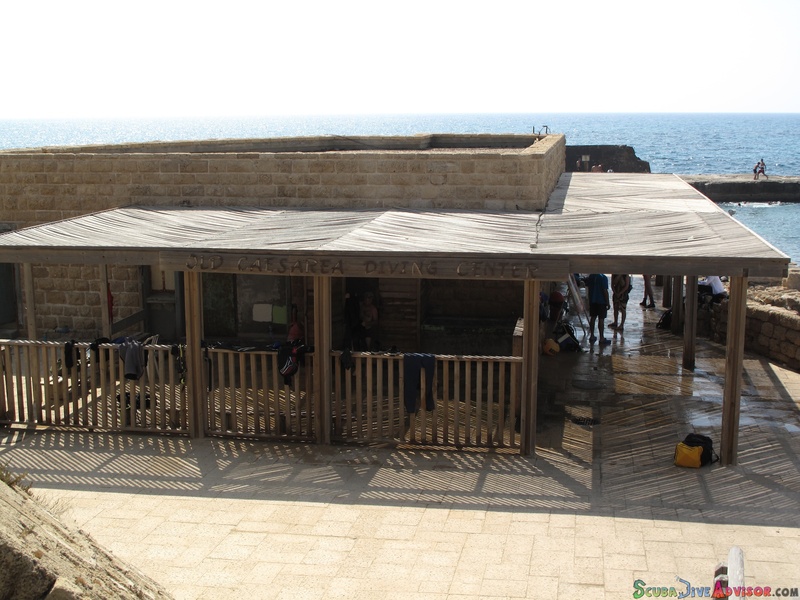 We made our way to the Old Caesarea Diving Centre at the end of the pier. With a little advance research, we discover it is the only dive operator located within the National Park and upon arrival, our first impression of the dive center was that of chaos and confusion. There were so many people everywhere! In fact, there were so many people in the dive shop that it was difficult to differentiate between divers and employees. We just needed to figure out the process for renting gear and getting started. Once the crowds seemed to dissipate, we found some counter real estate to talk to the coordinator and set up our time with a dive guide. The dive guide is necessary to explain the underwater archeological sites and review the dangers of the area. Getting outfitted with our gear seemed relatively easy as the rental coordinators were able to guess our sizes with a quick glance. Some of the equipment seemed a little old, but it was functional and would be good enough for the single dive. Note: The dive center is very strict about only accepting certified divers. Without exception, your dive card, proof of dive insurance (i.e. DAN) and log book, with recent dives or a minimum number of dives, must be presented. All three are necessary to dive this unique historical site. We did not have our log book but the coordinators fortunately accepted the 30 recent dives as shown on our dive computers. Before we dropped in the water, we were encouraged to discover the Mediterranean water temperature hugging the Israel coastline is much more temperate than previous experiences in the shared body of water around Italy’s southern island of Lampedusa. 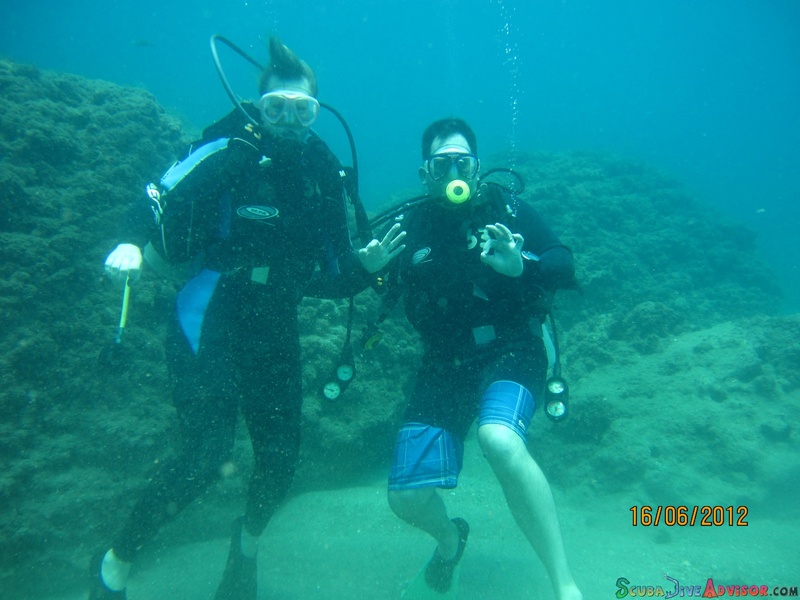 With temperatures hovering around 24˚C, Lana only required two wetsuits to keep her comfortable for her dive! Our dive master is a delightful Russian Israeli who really knows the area and explained the sites as shown on his map. He described the amount of swimming that would be involved above and below the surface as the archeological site is quite large and the underwater remains of the harbor are no different. The dive had some interesting logistics. A dicey entry with moss-covered concrete steps into a one meter deep rocky bottom demanded each divers complete attention. Plan for a long swim to the site (10 minutes) and shallow depths can present buoyancy issues for novice divers (5 – 10m). The dive is pretty much at safety stop depth the entire dive and because of the shallow depth and concrete pylons in the water, it created a surge which can play havoc with persons who may experience underwater motion sickness. Halfway through the dive, Lana was feeling nausea because of a combination of the surge, her mask was too tight, and probably because she had two wetsuits on. It was a 70 minute dive of solid swimming and this left Lana knackered. The dive visibility was pretty decent for the Mediterranean at about 15 meters despite a sandy bottom. Groups seem to be small at about 6-8 persons which is great and we were fortunate to be in a group with experienced divers from Israel and Italy. A safety buoy is necessary because there is a risk for fisherman lines off the pier and boat traffic nearby. The true highlight of the dive is the opportunity to see the ancient harbor below, a collection of ancient (stone) and modern (iron) anchors below and the location of where the lighthouse would have stood. While the archeological dive site stole the show, marine life was still present. There was even a cool species of nudibranch which excited Tim. The dive guide was great at referencing the sites on the map under water, and with great coverage and discipline in 70 minutes, one dive proved to be sufficient as the group collectively decided a 2nd dive would not be necessary. Multiple dives are fine for those who want to explore more. We enjoyed the rest of the afternoon like true divers; loitering around the Old Caesarea Dive Shop sharing stories, planting themselves at one of the cafes and then escaping the heat of the day by taking advantage of the museums and movie presentations which were exceptionally done. We followed up our below water adventure with an above ground exploration of the area as we explored the Roman and Byzantine ruins. Simply fantastic! Caesarea may have 2000+ years of history but it certainly is well-established in the 21st century for modern-day conveniences. Many other sites may top your list for Israel, but Caesarea should definitely be considered. It will appeal to both diving enthusiasts and land explorers alike. Posted in Scuba Dive Operators, Scuba Dive Sites.Tagged Byzantine, Caesarea, Dive, Diver, Diving, Europe, Israel, Mediterranean, Ocean, Photography, Roman, Scuba, Scuba Diving, Tel Aviv, Travel, Underwater.